In this video, you will learn how to calculate the volume and surface area of select solid figures such as a prism, sphere, cone, cylinder, and pyramid. The volume of a three-dimensional figure is the amount of space it takes up. The lateral area of a three-dimensional figure is the sum of the outermost layers of a figure except for the bases. The surface area of a three-dimensional figure is the sum of the outermost layers of the figure. 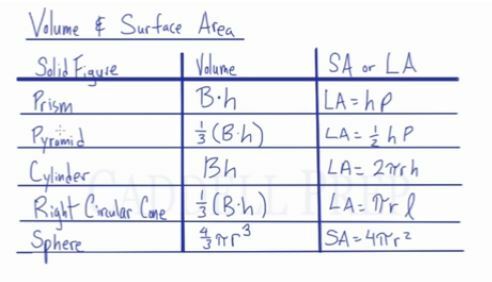 In this lesson, we’ll cover formulas for volume and surface area. Let’s start with the prism. A prism could be a rectangular prism, for example. Where the top and bottom are the same and extended vertically. The bottom is a rectangle and the top is also a rectangle. A cube is also a prism. We have a square on all six sides. We could have a triangle prism as well. The top and bottom are a triangle and the vertical lines are extended upwards. where is the area of the base, we just have to find out what is the area of the base and then we have to multiply it to the height . For a cube, we have to find out what is the area of the base square then multiplied by its height. And for this triangle, we should find the area of the base triangle multiplied by its height. That’s finding the volume of a prism. What is the lateral area? The lateral area is the area of the sides. The area of the front, back, left, and right sides. We have to find the lateral area all the way around. To find the lateral area all the way around it, you just have to multiply the height by the perimeter . We have to find out the perimeter of the base. To do this, we just have to add up the lengths multiplied by its height. We have to find the total surface area, we have to find the area of the top and bottom and add that to the total lateral area. Now, let’s look at the volume and the surface area of a pyramid. Pyramid has a square base and then it extends to a point above it. It looks something like this. We have a square or rectangle base and the sides are all triangles. where is the area of the base, in this case, the base is a square. So, we have to calculate the area of the square multiplied it by its height. Height is from the bottom to the highest point which is if you’re inside, it goes straight down and will make a right angle with the base. P is the perimeter of the base. In this case, its the square. Just add up all the sides multiply it by its height and do of that, you’ll get the lateral area. Lateral area is the area of the sides. It excludes the area of the base. That’s why we have to find the area of the square base and add that on. Now, let’s look at the cylinder. A cylinder has a circular top and bottom, similar to a can, and has a height. Here, the base is a circle. We have to find the area of a circle which is . Here, is the formula for circumference. We have the distance of the circle base multiplied by its height. Compared to prism’s formula where height multiplied by the perimeter, here, we have height multiplied by circumference. Lateral area is the area going around the cylinder. But it doesn’t include the top and the bottom. If we had to find the total surface area of a cylinder, we have to calculate the area of the top and the bottom and then add that on as well. including the top and the bottom. The total lateral area is just going around the sides. Now, let’s go over the right circular cone. The base of a right circular cone is a circle. Then it goes up to a point or an apex. where is the area of the base and is the height computed from the very top to the bottom. Now, let’s look at lateral area. where is the length of the side of a cone. This is a right circular cone so if we drew the height down the middle and extend the radius to that point, we’ll have a right angle. So, we’ll have a right triangle with the height and radius. Now that we have a right triangle, we can solve for the length if it’s not given using the Pythagorean theorem. The lateral area will give us the area going around the cone but will not include the bottom of the cone. If we want the total surface area, including the base circle, we have to do the lateral area plus area of the base circle. Let’s go over the volume and surface area of a sphere. A sphere is like a ball or marble. It’s a circular 3D shape. The radius go from the center to the edge. You could think of the surface area if you’re making a leather basketball. You can use the surface area to determine how much leather you would need to make the ball. What amount of area you will need to make a ball. The nice thing about the near stage amateur regions is that you’re given formulas. You’re not expected to memorize every formula on this list. They actually give you the formula for the volume of the pyramid but not the formula for lateral area. Also, they give you the formula for the volume and lateral area of a cylinder. They give you the formula for the volume and lateral area of a right circular cone. Furthermore, they also give the formula for the volume and surface area of a sphere. But remember, when you’re solving for the lateral area in a cylinder and right circular cone is no problem. But if asked for the surface area, you have to do the lateral area plus the area of the base. For a cylinder, there’s a base at the top and the bottom. So, you have to multiply the base by two. it has just one base.